Don’t underestimate the YETI Roadie 20, it sure packs a punch. 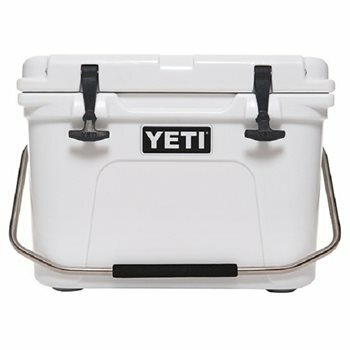 This cooler is the best companion for a day by the pool when you call in sick for work, or when you are on the golf course after telling your boss “my son has a dentist’s appointment.” With the same, sturdy, one-piece construction as the older brother Tundra cooler, the 20 is also grizzly proof. This portable cooler is made with a stainless steel handle for improved portability, unbreakable, self-stopping hinges for convenience, and is the best defense between your cold drinks and the sun. BYOB in style and comfort. With a No Sweat design, you won’t have to explain to that cute party-goer that, “No I didn’t pee myself, I was just carrying a wet cooler.” 18 1/2"L x 13 5/8"W x 14 3/8" H Capacity 5.2 Gallons / 14 Cans. Love this cooler! Keeps ice forever. Like the size of the Roadie. Well made and well worth the money! Impressive cold retention. Only downside is the weight of this cooler for its size. A heavy carry to the beach. Global had the best price. This cooler is great keeps things cold for a long, long time.